The traditional Danish music tradition is packed with wonderful songs of many kind and from many different periods. There are songs about handsome and adventurous sailors, soldiers and princes, and about lovely and in love sailors widows, peasant girls and elf queens. There are happy songs and merry joking songs, but there are also more heartfelt songs with reports of betrayal, longing and eternal love. Mia Guldhammer & Morten Alfred Høirup offer an evening with a broad extract of these songs. Some of them you can surely sing along with, but some of them you might hear for the first time, but they will always feel relevant, even if some of them are several hundred years old. 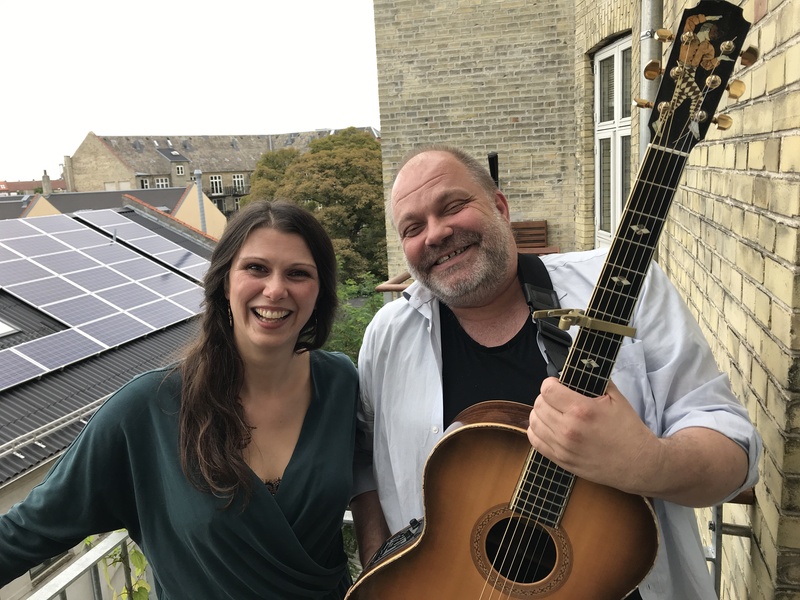 The songs will be arranged for two voices, guitar and shruti box, spiced up with ‘mouth music’ and instrumental pieces inspired by traditional music from Denmark and the world around us. Mia Guldhammer (Vocals, ‘shruti box’ and percussion) sang and played in her parents family orchestra when she was a child. Later she was learning from the traditional Danish music center of Hogager, and at the youth workshop of ROD. Today Mia Guldhammer is wellknown and respected as tradition carrier, and as one of our absolute higest profiled folk singers. Every year she sings in front of thousands of people at viking and medieval markets, venues and festivals in Denmark and internationally, together with Danish Virelai and Mallebrok, and in the project ‘Nøkken’ with breton band Dour/Le Pottier Quartet and Swedish singer Sofia Sandén. Morten Alfred Høirup (Guitar, vocals) played from he was quite young in his fathers wedding band, and later he became part of the Copenhagen folk music scene. For several decades the awarded singer and guitar player has been touring with new as well as traditional Danish music, and he has been singing traditional songs in front of concert audiences all over Great Britain, Europa, The US, Canada, Japan, Australia and New Zealand. Morten Alfred is probably mostly known for his work in the violin-guitar duo Haugaard & Høirup (1998 – 2008), the folk-world band Himmerland (2010-2015) and the trad trio Gangspil (2012-2017).